Kiteboarding along the Lake Michigan Shoreline, as with all kiteboarding locations, has many inherent risks. All kiteboarders are responsible for adhering to the rules and for being familiar with safety measures and procedures. Respect Gets Respect. The Lakeshore water temperature changes daily due to seasonal air temperature, currents, and wind direction. Hypothermia is a real risk and all riders should understand the signs and how to take preventative measures. 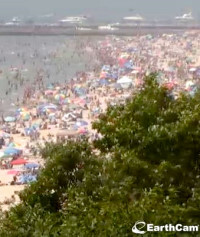 Beaches also become busy during the summer months. If the lakeshore area that you are kiting becomes densely populated, do not kite there. Beaches like Holland State Park and Grand Haven State Park are far too busy during the summer months to safely launch, land, and kite. Many areas, including the Ferrysburg Beach (North of Grand Haven Pier) are private beaches. This means no person, equipment or kite should be further than the "High Water Mark". All riders are responsible to keep their gear and themselves off of the private beach areas. All kiters are responsible to respect and respond respectfully to any beach property owners. The winds can clock around and build quickly due to Lake Effect Storms. 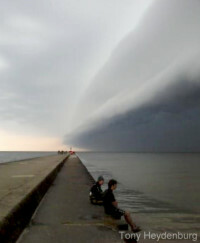 Shelf clouds and severe weather can turn nasty in less than 2-minutes! The leading edges of these storms collide with the warm shoreline, resulting in high winds, severe lightning, and dangerous conditions. Be aware of the forecast for the day and keep an eye on the skies. If thunder or lightning appears, get out of the water immediately! Gusts can easily be 20 mph+ above the current wind conditions and winds always increase upon the arrival of a storm front on the land.